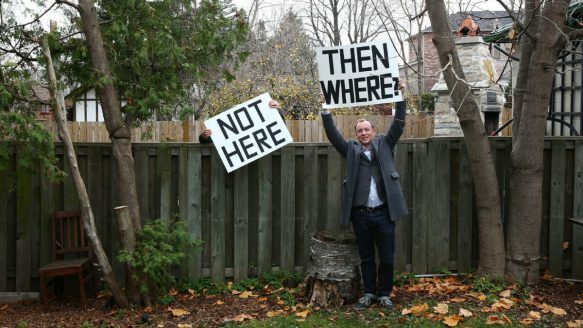 We begin with an interesting look at NIMBY-ism from Edward Keenan in Toronto Star (tst-nimby). Right now in Toronto, there are reportedly residents in Long Branch “up in arms” about a rumoured methadone clinic on Lake Shore Blvd. ; Cliffside homeowners fighting the scourge of sidewalks; Agincourt neighbours angry about a new bus garage; citizen groups from Ossington to Eglinton fighting the construction of duplexes and lowrises. Sadly, this message feels incomplete without some crime news, doesn’t it? According to police, an armed suspect attempted to get inside an ESSO located at 1138 Sheppard Avenue West at around 11 p.m. but was not successful. The police service's K9 unit was called in to assist with the investigation. Investigators describe the suspect as a black male who was armed with a gun. Police say he wore a black hoodie and a mask over his face at the time of the robbery. Toronto police are searching for suspects after two machete attacks in North Toronto. A 17-year-old boy’s hands were cut in one attack just before 10 p.m. at Jane and Wilson. Paramedics say the injuries are serious, but non-life-threatening. The suspect is described as white, about five-feet tall, and last seen wearing grey sweat pants a black leather jacket and a black toque. The circumstances surrounding the incident were not immediately clear, although police said they do not believe that the victim was targeted. In another incident near Sheppard and Kenneth Avenue, paramedics reportedly treated an 18-year-old with a severed finger. The teen’s finger was later found in a parking lot. Police reportedly couldn’t say whether there was a connection between the two attacks.